Alappuzha - Of ayurveda, backwaters, houseboats, coconut trees and paddy fields - Be On The Road | Live your Travel Dream! I was in the state of Kerala or more popularly referred to as 'God's own country'. The place was Alappuzha, a strip of land sandwiched between the Lakshadweep sea and the Punnamada Kayal (backwaters). This place is dotted with canals, lagoons and rivers. It was raining when I rode into Alappuzha town in the evening and I was very pretty much starving. After dumping my stuff at the hotel, I headed towards the beach and had a decent snack at one of the umpteen hotels that line up on Beach road. By the time I had satisfied my palate, the rain had picked up speed. I decided that it would be fun to explore the beach in heavy rain. Now, Alappuzha does not have a scenic beach setting like that of Hawaii, the islands in the Indian Ocean or Thailand or Bali, but it sure does offer a 2 km silent pretty looking shore with archaic and dilapidated architecture adjoining it. I felt like a free spirit walking alone on the beach with the rain pelting my back. The next day, I went on a backwater cruise on the Punnamada Kayal (backwaters). This is the place where most of Kerala's boat races take place, including the famous Nehru Boat Race. In terms of a backwater cruise, the tourist is provided with a lot of options. These options include a 6 day cruise from Alappuzha (Alleppey) to Kollam (Quilon), a 3 day Ayurveda cruise that takes one to Kottayam and a visit to the islands on Vembanad lake, just a plain, lavish and luxurious house boat that takes across the backwaters, a day cruise on the backwaters that take you to selected islands and show you the scenic locations and then you have the day cruise row boat. There are also other options that are tailored to the individual's tastes, budget and time duration. On an average, a luxurious house boat with television, air conditioning, double bedroom, fully functional kitchen and bathrooms and that can accommodate up to 10 people would cost 50 grand (in Indian rupees) a night. However, rates and their plans change from operator to operator. I opted for a 4 hour day cruise on the Punnamada Kayal (backwaters) that took me to the Vembanad lake, to many rivers and canals, to picturesque islands lined up with coconut trees and lush green paddy fields. When my boat passed through some of these small canals, I felt like I was in paradise with bright blue skies, pretty coconut trees, green water below me owing to colour of the coconut trees, fresh paddy fields and the gentle breeze blowing as my boat motored along slowly. My boat driver also took me to a couple of these home shops to sample the famous local drink - Kallu aka Toddy or Palm wine, an alcoholic beverage created from the sap of Palm trees. Also, used in the fermentation of the famous Kerala breakfast rice bread "Appam". Alappuzha - of Ayurveda, Backwaters, Houseboats, Coconut trees and Paddy fields: truly, a paradise in God's own country - Kerala. 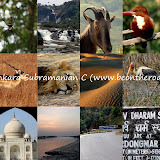 Note: Three pictures in this post are courtesy of Kerala Tourism and been used here with their written permission.